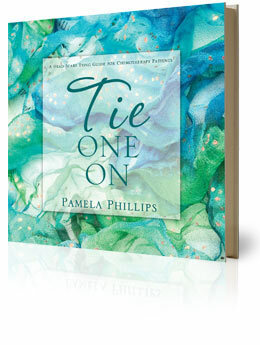 TIE ONE ON by Pamela Phillips features sixty beautiful full-color photographs with proven easy-to-follow head-scarf tying instructions. Step by step, this unique book guides the reader in creating stylish head coverings. Here is an attractive and comfortable alternative to wearing hot, itchy wigs, thanks to this wonderfully inspirational and encouraging book. This inspirational book features 60 full-color instructional photos and retails for $29.99. Teal Books is offering a special introductory price of $25.00 with free shipping. Teal is the official color for ovarian cancer. A portion of the proceeds of this book will support ovarian cancer awareness, education, advocacy and research.